7:30 pm till midnight Thursday 5th February St Cuthbert’s School, 122 Market Rd, Epsom Kick start the long weekend in the best way…dancing! There’ll be performances by guest teachers and a ridiculously fun class. The partners for Adam and Eve and Pot Luck Pro Am will be announced and then there’s dancing till midnight! There are 12 workshops over 2 days! 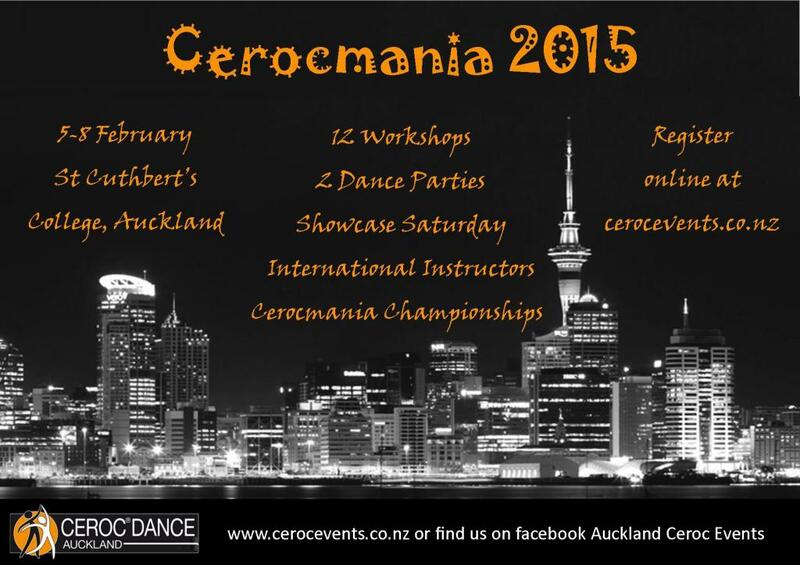 With 4 teachers coming in from Australia and 6 NZ teachers on offer, Cerocmania is a great opportunity to improve your dancing and learn from the best. For Intermediate and above there are 6 workshops that focus on musicality and moves. There’s a fundamental series for Beginners and above that covers footwork, timing, styling and connection. 3.30pm – midnight Friday 6th February 7pm – midnight Saturday 7th February St Cuthbert’s School, 122 Market Rd, Epsom Dust off your dance shoes and begin the year with a friendly competition! The competition is held on Friday afternoon with finals on Saturday night. The focus is on fun categories that you can just enter and show up to, without the hours of practice. Who knows you may find your next dance partner on the competition floor in one of our randomly paired events! Full Cerocmania Championships Events Program to come. 7pm – midnight Saturday 7th February St Cuthbert’s School, 122 Market Rd, Epsom As well as the competition finals, Saturday has some very special performances. There will be demos from visiting teachers and some of the best NZ dancers. To top the night off, there will be plenty of social dancing as well. The line up promises a very special night! 1-4pm Sunday 8th February Parnell Baths, Judges Bay Rd (also access by footbridge from Tamaki Drive) Relax and unwind on Sunday with a social event at the stunning Parnell Baths. It’s not every day you have great music and the opportunity to dance outside. Make the most of the Auckland summer with a traditional Kiwi BBQ and a dip in the salt water pools.